The airplane, with two flight crewmembers and a pilot-rated passenger on board, was on a cross-country flight. The departure and en route portions of the flight were uneventful. As the flight neared its destination, a high-altitude, terrain-limited airport, air traffic control (ATC) provided vectors to the localizer/distance measuring equipment (LOC/DME)-E approach to runway 15. About 1210, the local controller informed the flight crew that the wind was from 290º at 19 knots (kts) with gusts to 25 kts. About 1211, the flight crew reported that they were executing a missed approach and then requested vectors for a second approach. ATC vectored the airplane for a second LOC/DME-E approach to runway 15. About 1221, the local controller informed the flight crew that the wind was from 330° at 16 kts and the 1-minute average wind was from 320° at 14 kts gusting to 25 kts. The weather at the time of the accident was near or in exceedance of the airplane's maximum tailwind and crosswind components for landing, as published in the airplane flight manual. Given the location of the airplane over the runway when the approach became unstabilized and terrain limitations of ASE, performance calculations were completed to determine if the airplane could successfully perform a go-around. Assuming the crew had control of the airplane, and that the engines were advanced to the appropriate climb setting, anti-ice was off, and tailwinds were less than a sustained 25 kts, the airplane had the capability to complete a go-around, clearing the local obstacles along that path. Both flight crewmembers had recently completed simulator training for a type rating in the CL-600 airplane. The captain reported that he had a total of 12 to 14 hours of total flight time in the airplane type, including the time he trained in the simulator. The copilot would have had close to the same hours as the captain given that they attended flight training together. Neither flight crew member would have met the minimum flight time requirement of 25 hours to act as pilot-in-command under Part 135. The accident flight was conducted under Part 91, and therefore, the 25 hours requirement did not apply to this portion of their trip. Nevertheless, the additional flight time would have increased the crew's familiarity with the airplane and its limitation and likely improved their decision-making during the unstabilized approach. Further, the captain stated that he asked the passenger, an experienced CL-600-rated pilot. to accompany them on the trip to provide guidance during the approach to the destination airport. However, because the CL-600-rated pilot was in the jumpseat position and unable to reach the aircraft controls, he was unable to act as a qualified pilot-in-command. 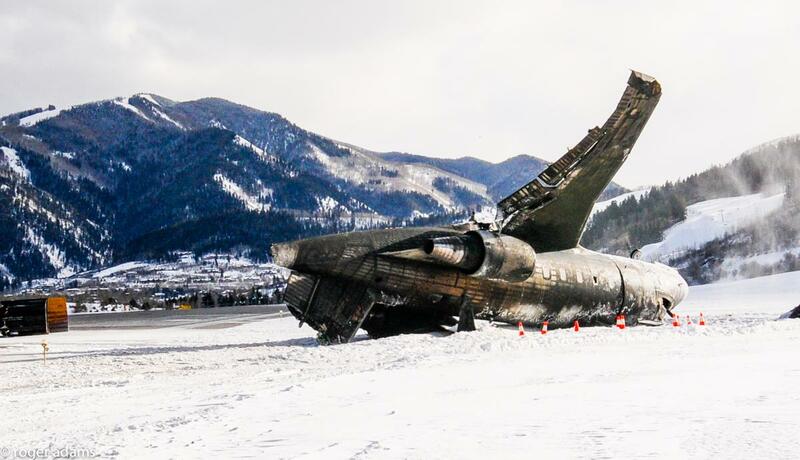 On January 5, 2014, at 1222 mountain standard time (MST), a Bombardier (formerly Canadair) CL-600-2B16 Challenger, N115WF, impacted the runway during landing land on Runway 15 at Aspen-Pitkin County Airport/Sardy Field (ASE), Aspen, Colorado. The copilot was fatally injured; the captain and the passenger received serious injuries. The airplane was destroyed. The airplane was registered to the Bank of Utah Trustee and operated by Vineland Corporation Company, Panama, South America under the provisions of 14 Code of Federal Regulations (CFR) Part 91. Visual meteorological conditions prevailed for the flight, which operated on an instrument flight rules (IFR) flight plan. The flight originated from the Tucson International Airport (TUS), Tucson, Arizona, at 1004. The departure and en route portions of the flight were uneventful. As the flight neared ASE, air traffic control (ATC) provided vectors to the localizer/distance measuring equipment (LOC/DME) approach to runway 15 at ASE. At 1210:04, the local controller at the ASE air traffic control tower (ATCT) informed the flight crew that the wind was from 290º at 19 knots (kts), with gusts to 25 kts. At 1211:18, the crew reported that they were executing a missed approach and then requested vectors for a second attempt. ATC vectored the airplane for a second LOC/DME-E approach. At 1220:35, the local controller informed the flight crew that the wind was from 330° at 16 kts and the 1-minute average wind was from 320° at 14 kts gusting to 25 knots. He then cleared the flight to land. For further information about the communications between ATC and the flight crew during the first approach and the accident approach, see the Communications section of this report. Airport surveillance video of the runway showed the airplane landing at ASE. The following sequence of events was seen in the video: the airplane above the runway in a slightly nose-down attitude, a flash of light consistent with a runway strike, the airplane in the air above the runway in a nose-down attitude, and the airplane impacting the runway in a nose-down attitude and being engulfed in light. About 4 seconds elapsed between the runway strike and the final impact. The airplane came to rest inverted on the west side of runway 15, halfway between taxiways A5 and A6. The ASE airport operations and aircraft rescue and firefighting (ARFF) station was located on the west side of runway 15, about 0.3 miles north of the accident site. ASE ARFF had witnessed the accident occurring and responded immediately, requesting clearance onto the runway about 50 seconds after the accident occurred. The captain, age 52, was a citizen of Mexico. He held a Mexican air transport pilot certificate that included an Airbus-320 type rating and ratings for airplane multi-engine land and instrument airplane. The captain also held a Federal Aviation Administration (FAA) temporary airman certificate issued on November 9, 2013. The temporary commercial pilot certificate included a CL-600 type rating and ratings for airplane single-engine land, airplane multi-engine land rating, and instrument airplane. The certificate was subject to a limitation for English proficiency. Upon FAA review of the pilot's temporary certificate after the accident, it was determined that a limitation on the pilot acting as pilot-in-command for the CL-600 should have been included on the temporary certificate; however, the limitation had been overlooked by the designated pilot examiner who issued the certificate. The limitation would have restricted the captain from serving as pilot-in-command in the CL-600 airplane with revenue passengers on board until he had acquired 25 hours of actual flight time in the CL-600 with another qualified pilot. The captain was issued a first-class airman medical certificate on August 27, 2013, with the limitation: must have available glasses for near vision. On November 8, 2013, the captain completed training for the CL-600 type rating at Simuflight in Dallas, Texas. According to the training records, the pilot received a "satisfactory" rating at the completion of the training checkride. During post-accident interviews, the captain stated that he did not have any trouble during his flight training other than with use of the flight management system (FMS). His flight experience in CL-601 airplanes at the time of the accident consisted of a ferry flight from Dallas, Texas, to Toluca, Mexico and a flight from Toluca, Mexico, to Eagle County Airport, Colorado, and back to Toluca, Mexico. He stated that his total flight time in the CL-601 was 12 to 14 hours, which included his flight training at Simuflight. He explained that he had accrued 8,000 hours flying the Airbus 318, 319, and 320 before flying the CL-601 and had about 17,000 hours of total flight time. The Airbus time reported was completed under his Mexican Flight Certificate and did not transfer to his FAA issued certificate. The copilot, age 54, was a citizen of Mexico. He held a Mexican air transport pilot certificate that included an Airbus-320 type rating and ratings for airplane multi-engine land and instrument airplane. The copilot also held an FAA temporary airman certificate issued on November 14, 2013. The temporary commercial pilot certificate included a CL-600 type rating and ratings for airplane single-engine land, airplane multi-engine land and instrument airplane. The certificate was subject to a pilot-in-command limitation for the CL-600. This limitation restricted the copilot from serving as pilot-in-command in the CL-600 airplane with revenue passengers on board until he had accrued 25 hours of actual flight time in the CL-600 with another qualified pilot. The certificate was also subject to a limitation for English proficiency. A limited first class medical certificate was issued to the copilot on December 13, 2012, with the limitation: must have available glasses for near vision. A limited first class medical is valid for 6 months from the time of issuance for operations requiring a first class medical; it is valid for 12 months from the time of issuance for operations requiring a second class medical; and, after 12 months, it is valid only for operations requiring a third class medical. At the time of the accident, 13 months after the time of issuance, the copilot's medical certificate would have been equivalent to a third class medical certificate. The copilot reported on his most recent medical certificate application that he had accumulated 20,398 total flight hours, with 31 hours in the previous 6 months. The copilot's logbook was not located during the investigation. The flight time reported on the copilot's medical certificate application was completed under his Mexican pilot certificate and did not transfer to his FAA issued certificate. On November 9, 2013, the copilot completed training for the CL-600 type rating at Simuflight in Dallas, Texas. According to the training records, the copilot received an "Unsatisfactory" rating at the completion of the training checkride. Records indicate the copilot did not satisfactorily complete two tasks under the "missed approach" approach skills, including "from a nonprecision approach" and "engine out." On November 14, 2013, the copilot was re-tested and received a "satisfactory" rating at the completion of the second training checkride. The pilot-rated passenger, age 52, was a citizen of Mexico. The passenger also held an FAA, foreign-based commercial pilot certificate with airplane single-engine land and airplane multi-engine land ratings. No type rating for the CL-601 was included on the FAA- issued commercial certificate. The FAA certificate was issued on the basis of and only valid when accompanied by his Mexican pilot certificate. Additionally, the FAA certificate was not valid for the carriage of persons or property for compensation or hire or for agricultural aircraft operations. The passenger held a first class medical certificate issued on December 9, 2013, with the limitation: must have available glasses for near vision. According to the captain, the passenger was his and the copilot's friend. The captain also reported that the passenger was an experienced pilot on the CL-601 and was invited to join them on the trip to "provide any recommendations" because of the "special conditions" at ASE. The passenger was sitting in the flight deck jumpseat position. The airplane, a Bombardier (formerly Canadair) CL-600-2B16 Challenger 601-3R variant, was a twin-engine corporate jet (serial number 5153) manufactured in 1994. It was powered by two General Electric, CF34-3A1 turbofan engines rated at 9,000 foot-pounds of thrust. The airplane had an occupancy of 12 passengers and 2 crewmembers, with an additional jumpseat for a cabin crewmember. According to the information provided by the captain, the most recent inspection on the airplane's approved aircraft inspection program was completed on December 18, 2013, at an airframe total time of 6,750 hours. "the maximum tailwind component approved for take-off and landing is 10 kts." The observations for ASE indicated IFR conditions with light snow in the morning with visual flight rules (VFR) conditions prevailing at the time of the accident. Immediately before the airplane's arrival in the area, the wind speeds began to increase with gusts to 28 kts. The gusty winds lasted from 1153 to 1553, and northwesterly wind gusts of 25 kts or more were reported. The National Weather Service (NWS) Terminal Aerodrome Forecast (TAF) for ASE that was current at the time of the airplane's departure from TUS indicated that the wind at the airplane's estimated time of arrival into ASE would be from 340º at 11 kts with no gusts or low-level wind shear forecast. Wind from 310° true at 9 kts gusting to 28 kts, wind variable from 270° to 360º, visibility 9 miles in haze, a few clouds at 3,500 ft above ground level (agl), ceiling broken at 4,600 ft, overcast at 5,000 ft, temperature - 11° Celsius (C), dew point temperature -20° C, altimeter 30.07 inches of mercury (Hg). Remarks: automated surface observation system, peak wind from 320° at 28 kts occurred at 1150, sea level pressure 1024.3-hPa, temperature -11.1° C, dew point -20.0° C.
Wind from 320° at 14 kts gusting to 25 kts, wind variable from 280° to 360°, visibility 10 miles in haze, scattered clouds at 4,700 ft agl, ceiling broken at 6,000 ft, temperature - 12° C, dew point temperature -21° C, altimeter 30.07 inches of Hg. The remarks indicated a peak wind from 320° at 26 kts occurred at 1204. An urgent pilot report (PIREP) over ASE at 1205 from a Learjet 35 flightcrew reported low-level wind shear with a 10 kt loss of airspeed on a 2-mile final to runway 15. It was undetermined if the accident airplane received this PIREP. Several surrounding airports also reported strong gusting northwest winds during the period. Lake County Airport (LXV), Leadville, Colorado, located 25 miles east of ASE, reported IFR conditions in light to heavy snow with west-northwesterly winds gusting to 31 kts. Copper Mountain (CUU), Colorado, located 36 miles east of ASE reported westerly winds at 20 kts gusting to 46 kts during the period. The NWS Grand Junction (GJT), Colorado, upper air sounding at 0500 depicted a shallow surface-based temperature inversion with light winds below 300 ft and northwesterly winds above that altitude with little variation in direction and increasing wind speeds. The mean wind was from 324° at 39 kts. The wind and temperature profile supported a light-to-moderate mountain wave formation with respect to updrafts, downdrafts, and turbulence potential. The following excerpt from the FAA ATC transcription details communications between the airplane's flight crew and ATC during the first approach and the accident approach. 1210:04 (ATCT) Wind 290 at 19, 1-minute average wind 320 at 12 gust 25, runway 15 cleared to land. 1210:15 (N115WF) Cleared to land, roger. 1210:38 (ATCT) Falcon just reported a gain of 20 kts, use caution for low level wind shear. 1211:07 (ATCT) winds 310 at 10. 1211:18 (N115WF) Okay. Missed approach. 33 kts of tailwind. 1211:26 (ATCT) Execute publish missed. 1211:37 (ATCT) Climb and maintain 16,000, expedite your climb, execute published missed. 16,000 on the missed. 1211:45 (N115WF) Executing. Climbing to 16,000. 1212:38 (ATCT) Contact departure 123.8. 1212:53 (Approach) N115WF aspen departure, say intentions. 1213:03 (N115WF) Okay. We turn back and do another approach. We got a tailwind of 30 kts. 1213:10 (Approach) Roger. Fly heading 310, vector localizer DME echo approach. 1213:16 (N115WF) 310 and vectors again got localizer 15. 1213:42 (Approach) N115WF descend and maintain 13,400. 1214:07 (Approach) N115WF fly heading 290. 1214:10 (N115WF) Now heading 290, 115WF. 1215:12 (Approach) N115WF turn right heading 020. 1215:18 (N115WF) 020 on the heading 115WF. 1215:32 (N115WF) Confirm 15WF 020 on the heading. 1215:36 (Approach) N115WF turn right heading 060 now. 1216:56 (Approach) N115WF, 4 miles from jargu turn right heading 120 cross jargu at 13,400, cleared localizer DME echo approach. 1217:05 (N115WF) 120 on the heading to intercept localizer DME, 115WF. 1217:10 (Approach) and N115WF that's cleared localizer DME echo approach. 1218:01 (Approach) N115WF contact tower. 1218:37 (Local) N115WF Aspen tower. 1219:21 (Local) N115WF Aspen tower. 1219:26 (Local) Runway 15 continue for N115WF. 1219:28 (N115WF) We'll continue the 115WF. 1219:42 (Local) N115WF traffic 12 o'clock, 7 miles turning westbound 9,200 ft.
1220:08 (Local) N115WF traffic no factor. Disregard, no factor, westbound now. 1220:14 (N115WF) Roger 115WF. In IFR conditions now. 1220:35 (Local) N115WF winds 330 at 16, runway 15 cleared to land. 1-minute average 320 [at] 14 gust 25. Aspen-Pitkin County/Sardy Field is a certificated Part 139 airport, and the field elevation is 7,838 ft. It is a towered airport operating in Class-D airspace. The airport is equipped with one runway; runway 15/33 which is 8,006 ft in length and 100-ft wide. An aircraft rescue and firefighting station is located on the airfield and responded to the accident. Runway friction measurements were taken immediately following the accident using a Dynatest 6875 runway friction tester. The average friction for Runway 15 was 1.087mu, and the lowest reading was 0.781 mu for the section at the departure end of runway 15. According to the FAA, the minimum friction for a runway tested with the Dynatest device is 0.50mu. At the time of the accident, there was one notice to airmen (NOTAM) in effect at ASE related to Runway 15/33. This NOTAM, issued at 0609, stated "snow swept 75-feet wide" on the runway surface. Because of the terrain features surrounding ASE, alternate minimums (other than the standard approach minimums) were established for instrument approaches into runway 15 at ASE. Additionally, there are no IFR or visual flight rule approaches into runway 33 at ASE because of terrain limitations and noise restriction areas. The airplane was required to be equipped with an FDR that recorded a minimum of 18 parameters, as cited in 14 CFR Part 91.609(c). The NTSB's Vehicle Recorders Lab extracted the data contained on the Loral/Fairchild F1000 (P/N S603-1000-00, S/N 00523) FDR installed on the airplane. The FDR recording contained about 124 hours of data. The event flight was the last flight of the recording, and its duration was about 2 hours 18 minutes. The FDR data starting at 1208:00 showed a flight pattern consistent with the missed approach. After the missed approach, at 1219:45, about 2 minutes 37 seconds before the end of the FDR recording, the airplane began its final descent from a pressure altitude of about 12,900 ft. At this time, the left and right flaps were at 28º, the autopilot was "On", and the N1 speeds of both engines were decreasing through about 73%. Twenty-four seconds later, at 1220:09, while descending through a pressure altitude of about 12,500 ft, the autopilot transitioned to "Off" and remained off for the rest of the FDR recording. At this time, the N1 speeds of both engines were steady about 33%. Thirty-four seconds later at 1220:43, while descending through a pressure altitude of about 11,000 ft, the left and right flaps increased to 44º. Twenty-seven seconds later, while descending through a pressure altitude of about 9,150 ft, the N1 speeds of both engines began increasing. For the next 56 seconds, the N1 speeds of both engines varied together between a maximum of about 75% and a minimum of about 42%. Because this airplane was not equipped with an autothrottle, these changes in N1 speeds would have been commanded by a flight crewmember. Also during this time, the pitch angle oscillated between a maximum of 4.3º nose up and a minimum of -5.2º nose down. At 1222:06, the vertical acceleration peaked at 2.91 g (which was beyond the airplane's design envelope for load factor), and the pitch angle increased to about 5.6º. Over the next 16 seconds, until the end of the FDR recording at 1222:22, the pitch angle increased to about 15.3 º nose up, decreased to about -13.1º nose down, increased to about 24.7º nose up, and then settled to about 0º. Additionally, the vertical acceleration decreased to -0.17 g, peaked at 5.76 g and then settled at -1.46 g.
The airplane was required to be equipped with a CVR that recorded at least the last 30 minutes of aircraft operation, as cited in 14 CFR Part 91.609(e). The NTSB's Vehicle Recorders Lab extracted the data contained on the Fairchild A100A (P/N 93-A100-83, S/N 61480) CVR installed on the airplane. The CVR recording began at 1152:34 as the flight crew began receiving radar vectors for the first localizer approach into ASE. At 1155:07, static similar to cell phone interference for about 25 seconds occured followed by a chime similar to a cell phone alert. At 1155:19, another sound of a chime similar to a cell phone alert was heard, and the copilot stated he "turned it off, I do not know why it is … it's Whatsapp." Static interference similar to cell phone interference continued until 1156:53. At 1155:34, the approach controller advised the flight crew to turn left to a heading of 150 º. Between 1155:47 and 1157:16, there was discussion in the cockpit about the LOC/DME-E approach and discontent about being given delaying vectors instead of being given a slot in the landing sequence. At 11:56:29, another airplane (N7HB, a Gulfstream 280) requested to divert to Garfield County Regional Airport (RIL) in Rifle, Colorado, located about 50 miles northwest of ASE. At 1206:32, the flight crew listened to a recording of the ASE automated terminal information service (ATIS) report hearing only those parts broadcasting NOTAM information. Then the captain asked the passenger if vertical navigation (VNAV) could be used, and the passenger responded, "yes." The captain called for 20º of flaps. The copilot verified speed, and the flap handle was lowered. At 1207:12, the approach controller requested that the flight crew verify they were descending to 13,400 ft. The copilot responded "yes, ah we're slowing down the aircraft." The captain and copilot discussed why the airplane was not "going down." The passenger instructed the crew to turn on VNAV. At 1207:44, the approach controller directed the flight crew to turn left to a heading of 180 º, cross JARGU (an approach fix) at or above 13,400 ft, and cleared the flight to execute the LOC/DME-E approach. At 1208:13, the flight crew continued to setup for the approach. The captain asked the copilot for flaps 20 º. The copilot stated, "they're there, flaps 30." Then power was reduced, followed by the landing gear being lowered. The crew discussed attempting to intercept the localizer, and the passenger explained that they had not entered it into the FMS. The copilot asked the captain if he should input flaps 30 º, the captain agreed, and the flap handle was lowered. The crew slowed the airspeed down, and the passenger remarked that the speed was 65 (165). At 1208:51, the approach controller directed the flight crew to contact the tower. There was confusion about what altitude they needed to maintain to intercept the localizer. The captain and copilot thought they were too high, and the passenger advised "you're good." The flight crew continued to discuss being too high for the localizer. At 1209:32, the local controller called the flight crew because they had not contacted the tower yet. The flight crew continued to discuss being too high and unsure what altitude they should be at when they crossed the next approach fix. At 1210:00, the flight crew established contact with the local controller. The local controller advised that the wind was from 290 º at 19 kts, and the 1-minute average wind was from 320 º at 12 kts gusting to 25 kts. The local controller cleared the flight crew to land on runway 15. The copilot confirmed, "having the runway, cleared to land. And ah roger with the wind." Discussion about their altitude being too high continued in the cockpit. At 1210:38, the local controller advised the flight crew that a Falcon had just reported a gain of 20 kts and to use caution for low-level windshear. At 1210:45, the copilot replied, "ah roger," and the flight crew continued discussing the airplane's high altitude. The copilot said, "pull the power," and the passenger confirmed that the crew was "established." The copilot remarked, "we have a 30 knot tail wind dude," and "they had 20 tailwind gusts." At 1211:08, the local controller announced "wind 310 at 10 kts". The copilot was repeating the winds just reported when the captain stated, "we're at 5 miles. Whoa dude the runway is right here dude." The copilot, passenger, and captain agreed the it was "impossible" to make the runway. The copilot announced a missed approach and stated, "there's 33 kts of tailwind." The flight crew executed a missed approach. The local controller cleared the flight crew to execute the published missed approach to 16,000 ft.
At 1212:38, the local controller advised the flight crew to contact approach control. No confirmation was received from the flight crew, the local controller repeated the instruction to contact approach control, and the flight crew acknowledged the frequency change. At 1212:53, the flight crew contacted approach control, and the controller asked the flight crew their intentions. The passenger told the flight crew "to return back." The copilot informed the controller that they wanted to return for another approach and added "we had a tailwind of 30 knots." The approach controller began to provide the flight crew with vectors for the LOC/DME-E approach. At 1213:24, the flight crew began setting up the approach in the FMS again. For about the next 4.5 minutes, the flight crew and passenger attempted to program the FMS. At 1216:57, approach advised N115WF they were 4 miles from JARGU, fly heading 120, cross JARGU at 13,000 feet, and cleared the Localizer DME Echo approach. The copilot partially readback the clearance, with an error, and the controller corrected the error. At 1218:01, the approach controller directed the flight crew to contact the tower. The flight crew acknowledged. The passenger began to instruct the captain through the approach, including input of flaps as well as altitude and airspeed guidance for descent. At 1218:49, the captain said that the wind was at 26 kts and remarked that once through the mountains, the winds might decrease. The passenger replied, "don't worry" and continued to provide instructions on the approach. At 1219:22, the local controller contacted the flight crew and instructed them to continue the approach to runway 15. For about the next minute, the captain continued to fly the approach with some input from the passenger and copilot. There were multiple remarks that the altitude was too high and they needed to "go lower." At 1220:29, the copilot stated, "put in speed brakes, put in speed brakes." followed by pointing out, "there's the runway." The captain replied with an expletive and requested gear down. At 1220:35, the local controller said "wind 330 at 16. Runway 15 cleared to land. One-minute average 320 at 14 kts gusting to 25 kts." At 1220:35, the passenger called for full flaps, and the sound of an altitude alert was heard, followed shortly thereafter by the enhanced ground proximity warning system (EGPWS) alert "sink rate, sink rate." The copilot announced "tail wind is 39 kts. Like 35 kt tail wind. Careful." The passenger stated "as we get lower, I'll take out the flight spoiler for you." The EGPWS announced "sink rate, sink rate" again. The copilot told the captain to add a little power followed 10 seconds later by "take off power. Less less less less less less less." The captain replied, "wait dude because I need to control this." At 1221:36, the copilot said, "this wind is from the tail. This is screwed." He then remarked, "maybe it will calm down by the mountain." The copilot instructed, with strain in his voice, to "follow to the center. To the center. That's it. There you go"; this was followed by the sound of a reduction in power. The passenger and copilot called out 100 ft. The passenger instructed, "put it through." In a strained tone, the copilot remarked, "oy oy, oy ah." The pilot used some expletives and then stated, "the winds are screwed." The passenger instructed the flight crew to lower the spoiler, and the copilot told him, "No no. Careful careful." The passenger instructed, "lower it, lower us." The copilot said, "no, let's go." The passenger repeated, "lower us." There was a power increase, then decrease, and the airplane contacted the runway. A warning sound of either flight spoilers extended or take-off configuration warning was heard, followed by a stall warning. The tower remarked "go around, go around, go around," followed by someone in the flight deck stating, "let's go, let's go." The recording ended at 1220:10. The airplane was found inverted beside the runway with fire damage on the fuselage and wings. The inside of the cockpit and cabin did not show evidence of fire. The airplane's under belly from the air driven generator to the underside of the inboard right wing had markings consistent with ground scraping. The right upper cockpit structure was partially collapsed and structurally breached. The right wing was folded beginning about 1/3 of the wingspan from fuselage. The left wing was bent downward (relative to the airplane's resting position) outboard of the outboard flap. The upper section of the vertical stabilizer, including the horizontal stabilizer, was detached from the main hull. Both main landing gear were found in the extended position and connected only by their side stay actuators. Examination of the left and right main landing gear attachment points on the wing spars and trunions showed the pivot bushings intact and in their bore holes. The right main landing gear door link was still attached. Both main landing gear attachment fittings were found structurally intact. The nose landing gear wheel well structure was deflected upward but did not contact any flight control beam assemblies under the cockpit floor. The nose landing gear was folded about 70º aft and 30º to the left. The right axle for the nose landing gear was severed, and the right nose wheel tire was missing. The left nose wheel was missing a portion of the inboard hub rim. The nose landing gear lower oleo strut had markings consistent with ground scraping on the axle jack point. A portion of the nose landing gear axle fracture surface had markings consistent with ground scraping. The flaps were found in a deployed position. The right inboard and outboard flaps were disconnected from the wing. The left inboard flap's inboard and outboard actuator screws were severed. The left outboard flap was attached to the wing by both actuators and hinges. The outboard flap screw actuator was measured from the gearbox housing aft surface (just forward of the dog stop ring) to the face surface of the ball screw assembly and found a distance of 5 3/4 inches. The exposed threads were counted and found 26 threads indicting a flap position of 45º. The horizontal stabilizer trim actuator jack screw was examined and found intact. The measurement from the gear box upper surface to the upper gimbal lower surface was 4.85 inches, indicating a trim setting of about 4.85 (trim indicator range is from 0-9; 0 is full nose-down and 9 is full nose-up; a measurement of 7.59 inches equates to about full nose-down). The left electrical connector for the horizontal stabilizer trim noise suppressor was found pulled from its connection. The left and right main angle of attack (AOA) vanes were found intact with no visible damage. Both vanes moved normally when a finger force was applied. The right aux AOA vane had no visible damage; however, it did not move when a finger force was applied. The outer cowling of the left engine, S/N 807029, did not appear to sustain any impact damage. The outside of the engine cowl, the fan inlet, and the fan blades exhibited smoke sooting. The cowls and core cowls were able to open normally. The engine under the cowls was free of soot and appeared normal. The main fuel control lever/linkage feedback match marks were aligned consistent with an engine that was in the "OFF" position. No other anomalies were noted while the engine was still mounted to the airplane. After the engine was removed from the airairplane, it was placed on the ground and further inspection was conducted. During engine removal, all engine to pylon connections were visually inspected and appeared normal. The fan blades did not sustain any visible damage. The inner surface of the fan inlet appeared bubbled and heat distressed from 0-90º aft looking forward (ALF). The fan was free to turn by hand with no abnormal sounds noted. There were scrapes on the outside of the fan case from 270-0º ALF. Visual inspection of all under cowl areas indicated all hardware was consistent with a normal flight engine. The fan cowls were not removed from the engine. Visual inspection of the tailpipe indicated no anomalies with the low pressure turbine. The right engine, S/N 807136, sustained fire damage from the exterior of the airplane. The outer cowls showed burn-through from outside to inside in several areas. Melted cowl material had dropped onto the exterior of the engine cases and components. The upper cowl had to be pried and cut with a saw in order to open it. Under the cowls, the engine appeared normal with no indications of an engine fire. The main fuel control linkage feedback match marks were aligned consistent with an engine that was in the "OFF" position. No other engine anomalies were noted while the engine was still mounted to the airplane. After the engine was removed from the airplane, it was placed on the ground, and further inspection was conducted. During engine removal, all engine to pylon connections were visually inspected and appeared normal. Impact damage to the inner surface of the fan inlet showed deformation from 0-90º ALF. The fan did not rotate by hand. Contact was noted between the fan case and fan blades, as well as molten material from the postcrash fire in the area. A handful of blades showed un-blended foreign object debris (FOD) damage; both hard and soft body damage were noted. The un-blended FOD damage consisted of tears and bent material consistent with multiple foreign objects entering the fan with the engine still producing power. Visual inspection of all under cowl areas indicated all hardware was consistent with a normal flight engine with the exception of the soot and molten material from the postcrash fire. Fan cowls were not removed from the engine. Visual inspection of the tailpipe indicated no anomalies with the low pressure turbine. - The flap handle was at 45º. - The engine power levers were in the shut off position. - The engine reverse thrust levers was in the stowed position. - The landing gear handle was in the down position. - The flight spoiler handle was in the retract position. - The ground spoiler switch was in the on position. - The right control column was bent to the left about 20º. - The left and right control yokes were deflected to the right about 20º and appeared to be synched. - The pitch and roll disconnect handles were in their normally stowed position. - The EGPWS PBAs were in their normal out positions. - The pilot and copilot stall protection pusher switches were in the on position. - The air driven generator was in the deployed position. A post mortem examination of the copilot was conducted under the authority of Rocky Mountain Forensic Services, PLLC, Loma, Colorado. The cause of death for the copilot was attributed to multiple injuries. The FAA's Civil Aeromedical Institute performed toxicology examinations for the copilot which were negative for carbon monoxide, alcohol, and drugs. No toxicology exam was completed for the captain or the passenger. (5) Have logged at least 2,000 hours of flight time, of which 500 hours were in turbine-powered airplanes of the same class of airplane for which the type rating is sought. Paragraph (f)(2) of this regulation states that if the applicant does not meet one of the experience requirements of paragraphs (b)(1) through (5), as appropriate to the type rating sought, then the applicant's pilot certificate will be issued with a limitation that states: "The type rating is subject to pilot in command limitations," and the applicant is restricted from serving as pilot in command in an aircraft of that type. (4) Presents evidence of the supervised operating experience to any Examiner or FAA Flight Standards District Office to have the limitation removed. This rule applies to all pilot training accomplished for a Part 135 commuter and on-demand flight operator. The captain and copilot did not have the required 25 hours of flight time in the CL-600 airplane and therefore, did not meet the requirements of this regulation to act as pilot-in-command. However, because there were no revenue paying passengers on board the airplane, the accident flight was being operated under Part 91 as a general aviation flight. As such, the flight time requirement did not apply to the accident flight. An NTSB Vehicle Performance Specialist completed an airplane performance study using the data from the FDR. The study used the flight crew's calculations of the airplane's landing weight at 35,881 pounds and center of gravity (CG) at 512.6 inches. During the last 6 minutes of flight, the airplane descended from 13,500 ft and slowed from an airspeed of 220 kts. The airplane's descent angle for the last nautical mile of flight was about 4º, and its airspeed was about 140 kts. Runway 15 at ASE was on a magnetic heading of 151º (160º true); it began at an elevation of 7,680 ft and sloped upward at a gradient of 1.9%. During the last minute of flight, the airplane's track aligned with the runway heading. The wind was variable from 280º to 360º at 14 kts gusting to 25 kts. A 25 kt gust from 280º equates to a 21 kt crosswind and a 12 kt tail wind on runway 15. Wind from 340º would be a pure tailwind. The airplane's maximum tailwind component for takeoff and landing, as reported in the AFM, was 10 kts. According to the AFM, the maximum demonstrated crosswind component for landing on a dry runway was 24 kts. ASE was a high-altitude, terrain-limited airport. For the LOC/DME-E approach, the missed approach point was 2.6 nm from the threshold. The missed approach procedure was to execute a climbing right turn to 14,000 ft on a heading of 300º. The airplane had performed a missed approach before the accident landing. If attempting a go-around over the runway, there would be three points of high terrain (Aspen Mountain, the hill where the I-PKN localizer is installed, and Richmond Hill) beyond the end of Runway 15 to clear. Of the three, the location of the I-PKN localizer would require the steepest climb gradient from the runway threshold. To clear the I-PKN localizer, an aircraft would have to climb to 3,500 ft (to an altitude above 11,188 ft) in 31,000 ft of horizontal distance. The Aircraft Operating Manual (AOM) provided climb data from sea level to various altitudes for different take-off weights for international standard atmospheric conditions (ISA). The temperature on the day of the accident was colder than ISA, so climb performance would have been better than this data indicates, making the following evaluation conservative. Data provided were the altitude gain, time, ground distance, and fuel burn for conditions with both engines operating; no information was provided to indicate the change in climb performance with the anti-icing systems on, but a 30% degradation was assumed using other data from the AFM. Given the information known from the FDR, AOM, and AFM and the elevations of the airfield and obstacles to clear, it was determined that the airplane should have been able to clear both Aspen Mountain and Richmond Hill if the anti-icing was off. Clearing the I-PKN localizer location would require a more optimal climb performance and less than a 25 kts tailwind. However, the climb performance data used was conservative, the atmosphere was cooler, and the winds were variable. Additionally, the weather (scattered clouds at 4,700 ft agl, and a broken ceiling at 6,000 ft) might have allowed the crew to maneuver around the worst case terrain obstacles. On January 11, 2014, based on the events of the accident, ASE ATCT changed its standard operating procedures for dissemination of wind information. The 1-minute average wind data was established to be the "official winds to be issued" to pilots at ASE. While the local controller provided the 1-minute wind average (and associated gust information) to the accident flight crew during arrival, the procedure in place at the time of the accident allowed wind reporting to be controller discretion. Local controllers at ASE could provide flight crews either the instantaneous wind readings or the 1-minute average with 10-minute gust information. Although the ASOS continued to provide pilots with the 2-minute average wind with 10-minute gust data via the ATIS, the most updated wind data available (the 1-minute average wind data) from the stand-alone weather station (SAWS) was required to be provided by the ASE ATCT controllers. According to preliminary information from the Federal Aviation Administration, the flight was in radio contact with ASE air traffic control (ATC). At 1210, the crew utilized the localizer DME-E approach into KASE. ASE ATC reported winds as 290º at 19 knots (kts), with winds gusting to 25 kts to the crew before landing. The crew executed a missed approach, and then requested to be vectored for a second attempt. On the second landing attempt N115WF briefly touched down on the runway, then bounced into the air and descended rapidly impacting with the ground at midfield. No further communications were received by ASE ATC from the accident airplane. Video of the runway showed the accident aircraft landing at KASE. The sequence of events in the video was: the aircraft above the runway in a slightly nose down configuration, a flash of light indicating a runway strike, the aircraft in the air above the runway and nose down, and then the aircraft impacting the runway nose down and being engulfed in light. Approximately four seconds elapse between the runway strike and the final impact. The pilot, age 52, held a valid FAA Temporary Airman Certificate issued on November 9, 2013. The temporary commercial pilot certificate held ratings for airplane single-engine land, multi-engine land rating, type-rating for CL-600, and instrument airplane. The certificate was subject to a limitation for English proficiency. Upon FAA review of the pilot's temporary certificate after the accident, it was determined that the limitation of pilot-in-command for the CL-600 should have been included on the temporary certificate, however, the limitation had been overlooked by the designated pilot examiner. The pilot was issued a first-class airman medical certificate on August 27, 2013, with the limitation: must have available glasses for near vision and was valid at the time of the accident. On November 9, 2013, the pilot completed training for the CL601 type rating at Simuflight in Dallas, Texas. According to the training records, the pilot received a "satisfactory" rating at the completion of the training. The pilot stated he did not have any troubles during his flight training other than with management of the FMS system. His flight experience in the CL601 at the time of the accident consisted of a ferry flight from Dallas, Texas to Toluca, Mexico; and a flight from Toluca, Mexico to Eagle County Airport, Colorado and back to Toluca, Mexico. He stated his total flight time in the CL601 was 12 to 14 hours, including his flight training at Simuflight. He explained he accrued 8,000 hours flying the Airbus 318, 319 and 320 prior to flying the CL601, with about 17,000 hours of total flight time. The Airbus time reported was completed during flight time accrued on his Mexican Flight Certificate and did not transfer to his FAA issued certificate. The co-pilot, age 54, held a valid FAA Temporary Airman Certificate issued on November 14, 2013. The temporary commercial pilot certificate held ratings for airplane single-engine land, multi-engine land rating, a type rating for CL-600, and instrument airplane. The certificate was subject to Pilot-in-Command limitation for the CL-600 and a limitation for English proficiency. A limited First Class Medical Certificate was issued on December 13, 2012 with the limitation: must have available glasses for near vision. A limited first class medical is valid for 6 months from the time of issuance, the medical would then loose the first class medical privileges and assume the second class medical certificate. The second class would assume the privileges of a third class one year after date of issuance. At the time of the accident, one year and one month after the time of issuance, the co-pilot's medical certificate would have been equivalent to a third class medical. The pilot reported on his most recent medical certificate application that he had accumulated 20,398 total flight hours, with 31 hours in the previous 6 months. The co-pilot's logbook was not located during the investigation. The flight time reported during the co-pilots medical certification was accrued on his Mexican Flight Certificate and did not transfer to his FAA issued certificate. The pilot-rated passenger, age 52, held a valid FAA, foreign-based commercial pilot certificate with an airplane single-engine land and airplane multi-engine land rating. No type rating for the CL601 was included on the FAA issued commercial certificate. The certificate was issued and only valid when accompanied by his Mexican Pilot License. Additionally, the FAA certificate was not valid for the carriage of persons or property for compensation or hire, or for agricultural aircraft operations. A First Class Medical Certificate was issued to him on December 9, 2013, with the limitation: must have available glasses for near vision. According to the Pilot, the passenger was a friend of his and the co-Pilot's. The passenger was an experienced pilot on the CL601 and was invited to join on the trip to "provide any recommendations" because of the special conditions at ASE. The passenger was sitting in the flight deck jumpseat position. The accident airplane, a twin-engine corporate jet (serial number 5153), was manufactured in 1994. It was powered by two General Electric, CF34-3A1 turbofan engines rated at 9,000 pound-foot of thrust. The airplane had an occupancy of 12 passengers and two crewmembers, with an additional jumpseat for a cabin crewmember. According to the information provided by the pilot on the NTSB Pilot/Operator Aircraft Accident/Incident Report, the most recent annual inspection was completed on December 18, 2013, with an airframe total time of 6,750 hours. The maximum tailwind component approved for take-off and landing is 10 kts. The National Weather Service (NWS) Grand Junction (GJT) Weather Forecast Office was responsible for issuing the terminal area forecast (TAF) for the Aspen area. At 0500 MST, the NWS's upper air sounding depicted a shallow surface based temperature inversion with light winds below 300 feet (ft), and northwesterly winds above the altitude with little variation in direction with increasing wind speeds. The mean wind was from 324° at 39 kts. The wind and temperature profile supported a light to moderate mountain wave formation with respect to updrafts, downdrafts, and turbulence potential. The observations for ASE indicated IFR conditions with light snow in the morning with VFR conditions prevailing at the time of the accident. Immediately prior to the aircraft's arrival in the area the wind speeds began to increase with gusts to 28 kts. The gusty winds only lasted a short period between 1853Z and 2253Z where northwesterly wind gusts of 25 kts or more were reported. The wind event was not noted in the NWS TAF for Aspen issued at the time of departure from PHX, no winds over 10 kts were predicted for the estimated time of arrival. However, the NWS TAF for Eagle (EGE) current at the time of departure had expected westerly winds of 14 kts gusting to 21 kts during the same period. Wind from 310° true at 9 kts gusting to 28 kts, wind variable from 270° to 360, visibility 9 miles in haze, a few clouds at 3,500 ft agl, ceiling broken at 4,600 ft, overcast at 5,000 ft, temperature -11° C, dew point temperature -20° C, altimeter 30.07 inches of mercury (Hg). Remarks: automated surface observation system, peak wind from 320° at 28 kts occurred at 1150 MST, sea level pressure 1024.3-hPa, temperature -11.1° C, dew point -12.0° C.
Wind from 320 at 14 kts gusting to 25 kts, wind variable from 280 to 360, visibility 10 miles in haze, scattered clouds at 4,700 ft above ground level, ceiling broken at 6,000 ft, temperature -12 degrees (deg) Celsius (C), dew point temperature -21 deg C, altimeter 30.07 inches of mercury. The remarks indicated a peak wind from 320 at 26 kts occurred at 1204. An urgent pilot report over Aspen at 1205 MST from a Lear jet 35 flightcrew reported low-level wind shear with a 10 knot loss of airspeed on a 2 mile final to runway 15. 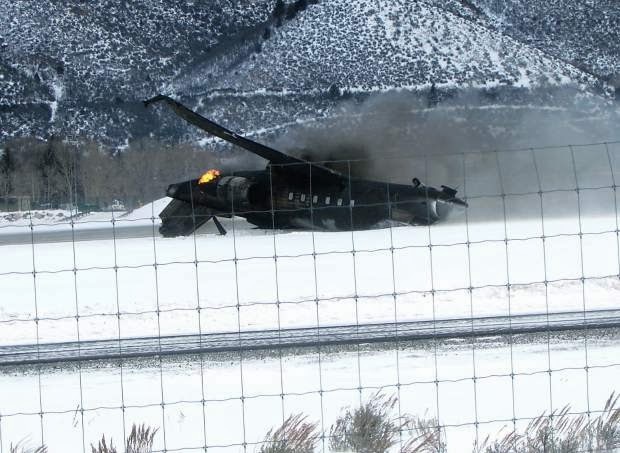 Lake County Airport (LXV), Leadville located 25 miles east of Aspen reported IFR conditions in light to heavy snow with west-northwesterly winds gusting to 31 kts at the time of the accident. Copper Mountain (CUU) 36 miles east of Aspen reported westerly winds at 20 kts gusts to 46 kts during the period. For further information, see the Meteorology Group Chairman's Factual Report within the public docket for this accident. Aspen-Pitkin County/Sardy Field is a certificated Part 139 airport. It is a towered airport operating in Class-D airspace. The airport is equipped with one runway; runway 15/33 is 8,006 ft in length and 100-ft wide. The reported field elevation of the airport is 7,838 ft mean sea level. An aircraft rescue and firefighting station is located on the airfield and responded to the accident. The airplane was found inverted with fire damage on the fuselage and wings. The inside of the cockpit and cabin did not have evidence of fire. The aircraft under belly from the air driven generator to the underside of the inboard right wing had marking consistent with ground scraping. The right upper cockpit structure was partially collapsed and structurally breached. The right wing was folded at approximately 1/3 of the wingspan from fuselage. The left wing was bent downward (relative to aircraft reference) outboard of the outboard flap. The upper section of the vertical stabilizer, including the horizontal stabilizer, was missing from the main hull. Both main landing gear were found in the extended position and connected only by their side stay actuators. Examination of the left and right main landing gear attachment points on the wing spars and trunions showed the pivot bushings intact and in their bore holes. The right main landing gear door link was still attached. Both main landing gear attachment fittings were found structurally intact. The nose landing gear wheel well structure was deflected upwards but did not contact any flight control beam assemblies under the cockpit floor. The nose landing gear was found folded approximately 70 deg aft and 30 deg to the left. The right axle for the nose landing gear was severed and the right nose wheel tire was missing. The left nose wheel was missing a portion of the inboard hub rim. The nose landing gear lower oleo strut had markings consistent with ground scraping on the axle jack point. A portion of the nose landing gear axle fracture surface had markings consistent with ground scraping. The flaps were found in a deployed position. The right inboard and outboard flaps were disconnected from the wing. The left inboard flap inboard and outboard actuator screws were severed. The left outboard flap was attached to the wing by both actuators and hinges. The outboard flap screw actuator was measured from the gearbox housing aft surface (just forward of the dog stop ring) to the face surface of the ball screw assembly and found a distance of 5 ¾ inches. The exposed threads were counted and found 26 threads indicting a flap position of 45deg. The horizontal stabilizer trim actuator jack screw was examined and found intact. Measurements taken from the gear box upper surface to the upper gimbal lower surface gave a distance of 4.85inches, indicting a trim setting of 4.85 (trim indicator is from 0-9, 0 is full nose-down and 9 is full nose-up). The left electrical connector for the horizontal stabilizer trim noise suppressor was found pulled from its connection. The left and right main Angle of Attack (AOA) vanes were found intact with no visible damage. Both vanes moved normally when a finger force was applied. The right aux AOA vane had no visible damage, however, it did not move when a finger force was applied. The left side engine, S/N 807029, outer cowling did not appear to sustain any impact damage. The outside of the engine cowl, the fan inlet and the fan blades exhibited smoke sooting. The cowls and core cowls were able to open normally. The engine under the cowls was free of soot and appeared normal. The main fuel control lever/linkage feedback match marks were aligned consistent with an engine that was in the "off" position. No other anomalies were noted while the engine was still mounted to the aircraft. After the engine was removed from the aircraft, it was placed on the ground and further inspection was conducted. During engine removal all engine to pylon connections were visually inspected and appeared normal. The fan blades did not sustain any visible damage. The inner surface of the fan inlet appeared bubbled and heat distressed from 0-90 deg aft looking forward (ALF). The fan was free to turn by hand with no abnormal sounds noted. There were scrapes on the outside of the fan case from 270-0 deg ALF. Visual inspection of all under cowl areas indicated all hardware was consistent with a normal flight engine. The fan cowls were not removed from the engine. Visual inspection of the tailpipe indicated no anomalies with the low pressure turbine. Right side engine, S/N 807136, sustained fire damage from the exterior of the aircraft. The outer cowls showed burn-through from outside to inside in several areas. Melted cowl material had dropped onto the exterior of the engine cases and components. The upper cowl had to be pried and cut with a saw in order to open it. Under the cowls, the engine appeared normal with no indications of an engine fire. The main fuel control linkage feedback match marks were aligned consistent with a shut off engine. No other engine anomalies were noted while still mounted to the aircraft. After the engine was removed from the aircraft, it was placed on the ground and further inspection was conducted. During engine removal all engine to pylon connections were visually inspected and appeared normal. Impact damage to the inner surface of the fan inlet showed deformation from 0-90 deg ALF. The fan did not rotate by hand. Contact was noted between the fan case and fan blades, as well as molten material from the aircraft fire in the area. A handful of blades showed un-blended foreign object debris (FOD) damage; both hard and soft body damage was noted. The un-blended FOD damage consisted of tears, and bent material consistent with multiple foreign objects entering the fan with the engine still producing power. Visual inspection of all under cowl areas indicated all hardware was consistent with a normal flight engine; with the exception of the soot and molten material from the aircraft fire. Fan cowls were not removed from the engine. Visual inspection of the tailpipe indicated no anomalies with the low pressure turbine. - The flap handle was found at 45 deg. - The engine power levers were found in the shut off position. - The engine reverse thrust levers was found in the stowed position. - The landing gear handle was found in the down position. - The flight spoiler handle was found in the retract position. - The ground spoiler switch was found in the ON position. - The right control column was bent to the left by approximately 20 deg. - The EGPWS PBAs were found in their normal out position. - The following circuit breakers were found collared in the OUT position on CBP-A: #67 IRU#3 BATT, ENTERTAIN (2 BREAKER), FWD. - The STALL PROTECTION PUSHER switches for pilot and copilot were in the ON position. - The Air Driven Generator was found in the deployed position. 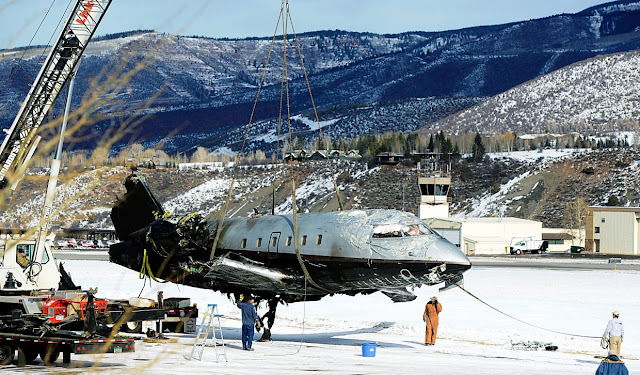 A post mortem examination of the co-pilot was conducted under the authority of Rocky Mountain Forensic Services, PLLC, Loma, Colorado on January 6, 2014. The cause of death for the co-pilot was attributed to multiple injuries. The Federal Aviation Administration (FAA) Civil Aeromedical Institute performed toxicology examinations for the co-pilot which was negative for carbon monoxide, alcohol and drugs. No toxicology exam was completed for the pilot or pilot-rated passenger. An NTSB Vehicle's Performance Specialist completed an Airplane Performance Study using the data from the FDR. For the purposes of the study, the elevation at ASE used was 7837 ft, the landing weight calculated by the crew was 35,881 pounds, and the center of gravity (CG) was 512.6 inches. During the last six minutes of flight, the aircraft descended from 13,500 ft and slowed from an airspeed of 220 kts. The aircraft's descent angle for the last nautical mile of flight was approximately 4 deg and its airspeed was about 140 kts. Runway 15 at KASE was on a magnetic heading of 151 deg (160 deg true); it began at an elevation of 7680 ft, and sloped upward at a gradient of 1.9 percent. During the last minute of flight the aircraft track aligned with the runway heading. The winds were variable from 280 deg to 360 deg at 14 kts gusting to 25 kts. A 25 kt gust from 280 deg would be a 21 kt crosswind and a 12 kt tail wind. Winds from 340 deg would be a pure tailwind. The aircraft's maximum tailwind component for takeoff and landing, as reported in the Airplane Flight Manual, was 10 kts. The maximum crosswind component for landing on a dry runway was 24 kts. KASE was a high-altitude, terrain-limited airport. The missed approach procedure was to execute a climbing right turn to 14,000 ft on 300 deg. The missed approach point was between 1.4 NM from the threshold to runway 15 (VHF Omni Directional Radio Range (VOR) approach) and 2.6 NM from the threshold (localizer (LOC) approach). The accident aircraft had performed a missed approach before the accident landing. There were three points of high terrain (Aspen Mountain, the location of the I-PKN localizer, and Richmond Hill) beyond the end of runway 15 to clear during an attempted go-around. Of the three, the location of the I-PKN localizer would require the steepest climb gradient from the runway threshold. To clear the I-PKN localizer, an aircraft has 31,000 ft of horizontal distance to climb 3,500 ft to an altitude above 11,188 ft. The Aircraft Operating Manual (AOM) provided climb data from sea level to various altitudes for different take-off weights for international standard atmospheric conditions (ISA). The temperature on the day of the accident was colder than ISA, so climb performance would have been better than this data indicates, making the following evaluation conservative. Data provided were the altitude gain, time, ground distance, and fuel burn for conditions with both engines operating; no information was provided to indicate the change in climb performance with the anti-icing systems on. Given the information known from the FDR, AOM, and elevations of the airfield and obstacles to clear, it was determined the aircraft should have been able to clear both Aspen Mountain and Richmond Hill. Clearing the I-PKN localizer would require a more optimal climb performance and less than a 25 kts tailwind. However, the climb performance data used was conservative, the atmosphere was cooler, the winds were variable, and anti-ice protection may not have been used. Additionally, the weather (scattered clouds at 4,700 ft above ground level, and a broken ceiling at 6,000 ft) might have allowed the crew to maneuver around the worst case terrain obstacles. For further information, see the Performance Study Specialist's Report within the public docket for this accident. The following air traffic control transcription details communications between the accident airplane (N115WF) flight crew and Aspen Airport Traffic Control Tower (ATCT) during the accident approach. 1212:53 (Approach) N115WF aspen departure, say intensions. 1219:42 (Local) N115WF traffic 12 0'clock, 7 miles turning westbound 9,200 ft.
On January 11, 2014, based on the events of the accident, Aspen ATCT changed the Standard Operating Procedures for dissemination of wind information. The one-minute average wind data was established to be the "official winds to be issued" to pilots at ASE. While the local controller provided the 1-minute wind average to the accident flight crew during arrival, the procedure in place at the time of the accident was to provide the most current wind data from the ASOS (a two-minute average wind data). It was up to controller judgment whether updated 1-minute average wind data was also provided to flight crews. Although the ASOS continued to provide pilots with the 2-minute average wind data via radio, the most updated information from the wind data available (the 1-minute average wind data) was required to be provided by ATCT, including the gust information. The accident airplane was operating such that it was required to be equipped with an FDR that recorded, at a minimum, 18 parameters, as cited in 14 CFR Part 91.609(c). The NTSB's Vehicle Recorders Lab extracted the data contained on the Loral/Fairchild F1000 (P/N S603-1000-00, S/N 00523) flight data recorder (FDR) installed on the accident airplane. The FDR recording contained approximately 124 hours of data. The event flight was the last flight of the recording and its duration was approximately 2 hours and 18 minutes. The parameters evaluated for the purpose of this report appeared to be in accordance with the federal FDR carriage requirements, except the flight spoiler parameter. The flight spoiler parameter was installed and appeared not to be working. During the investigation, the FAA was informed of the inoperative flight spoiler parameter. The FDR data starting at 1208:00 MST showed a pattern consistent with the missed approach. After the missed approach, at 1219:45 MST, approximately 2 minutes and 37 minutes before the end of the FDR recording, the aircraft began its final descent from a pressure altitude of approximately 12,900 ft. At this time, the left and right flaps were at 28 deg, the autopilot was "On", and engine 1 N1 (Eng1 N1) and engine 2 N1 (Eng2 N1) were both decreasing through about 73% revolutions per minute (RPM). Twenty-four seconds later, at 1220:09 MST, while descending through a pressure altitude of about 12,500 ft, the autopilot transitioned to "Off" and remained "Off" for the rest of the FDR recording. At this time, Eng1 N1 and Eng2 N1 were steady at about 33% RPM. Thirty-four seconds later at 1220:43 MST, while descending through a pressure altitude of about 11,000 ft, the left and right flaps increased to 44 deg. Twenty-seven seconds later at 1221:10 MST, while descending through a pressure altitude of about 9,150 ft, Eng1 N1 and Eng2 N1 began increasing. For the next 56 seconds, Eng1 N1 and Eng2 N1 varied between a maximum of about 75% RPM and a minimum of about 42% RPM. Also during this time, the pitch angle varied, peaking at a maximum of 4.3 deg and a minimum of -5.2 deg. At 1222:06 MST, the vertical acceleration peaked at 2.91 g's and pitch angle increased to about 5.6 deg. For the next 16 seconds, until the end of the FDR recording at 1222:22 MST, the pitch angle increased to about 15.3 deg, decreased to about -13.1 deg, increased to about 24.7 deg and then settled to about 0 deg. Additionally, vertical acceleration decreased to -0.17 g's, peaked at 5.76 g's and then settled at -1.46 g's. For further information, see the Flight Data Recorder Specialist's Factual Report within the public docket for this accident. N1 is the rotational speeds of the engine sections expressed as a percentage of a nominal value. The cockpit voice recorder recovered from the 2014 plane crash at the Aspen-Pitkin County Airport that killed a co-pilot revealed a jocular, expletive-filled atmosphere in the minutes leading up to the accident. About 12 minutes before the 12:22 p.m. crash on Jan. 5, 2014, one of three pilots aboard (two were in control, one was a passenger) said, “Yes, we have a 30-knot tailwind, dude,” according to the transcript of the recorder released Wednesday by the National Transportation Safety Board. The private Bombardier Challenger is rated for only 10-knot winds upon landings and takeoffs, the NTSB factual report says. The Mexican pilots, flying from Tucson, Ariz., had only limited experience with the twin-engine corporate jet, and the third pilot “was invited to join on the trip to ‘provide any recommendations’ because of the special conditions” at Sardy Field, the report says. Aspen’s airport is considered by many pilots to be one of the nation’s most challenging, with special training required for commercial crews. The recorder transcript, translated from Spanish, shows the pilots laughing about 19 miles from the runway, with one suggesting they should have gotten “dirty,” lingo for extending landing gear and flaps to slow the plane’s speed. “[Expletive] mm, hmm,” another pilot responded (who is speaking is not clear from the transcript). “We should be dirtying up the darn plane, dude,” the first pilot said. At one point, the air-traffic controller told the plane: “You copied our divert” to the Rifle airport and then asks the crew to stand by for clearance to that airport. The crew did not respond, according to the transcript. It was lightly snowing in Aspen at the time, and crews had cleared the tarmac of snow not long before the plane’s approach. The plane, 4 miles from Aspen, was directed to proceed directly to Sardy Field. The aircraft missed its first approach — with one pilot reporting 33 knots of tailwind — and circled around. Upon its second attempt, the plane touched down and bounced off the tarmac as the crew apparently again attempted to abort the landing. The plane, lacking enough power for the second takeoff, smashed into the runway nose-down and burst into flames. Co-pilot Sergio Carranza Brabata, 54, was killed in the crash. Pilot Moises Carranza Brabata, the brother of the man killed, and Miguel Henriquez, were seriously injured. A quick response from airport safety crews was credited with saving their lives. NTSB investigators haven’t been able to document why the crew continued into Aspen despite the high winds, nor whether the pilots were under a time crunch to land here, said spokesman Peter Knudson. Such potential contributing factors and other analysis could be revealed in NTSB’s probable-cause report, which is to be released in the coming weeks. But for now, “we’ve reached no conclusions,” Knudson said. The findings were in line with the NTSB’s initial investigation that suspected wind gusts as the cause. Mike Boyd, an aviation expert and principal of Boyd Group International, said Thursday that he wasn’t surprised by the report. Boyd said he believed the pilots simply made a mistake. “As long as you have humans in the cockpit” this can happen, he said.